In Zelda Breath of the Wild, you’ll find a total of four dungeons and they bring you a lot of treasure chests and other rewards. But before you get to these treasures you have to face bosses. On the way through the enigmatic caves, you will pass some treasure chests that will bring you powerful weapons and armor. - Preparation for the Dungeon: Pack up some dishes that will heal you and don’t forget arrows. We recommend you take at least 30 pieces. Also take strong weapons with an attack power of at least 15. - Shoot first at the eye at the entrance, as with his death, other curse monsters are also prevented from appearing. - To get to the displayed terminal, walk through the main room and keep to the left. To the right of the gate is another eye under water. 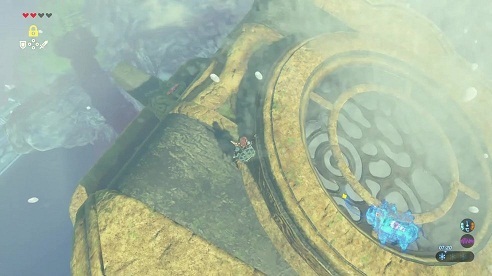 - If this is destroyed, you can use cryonis to push an ice block under the grid. Go to the terminal and check out Ruta. You can now control this trunk. - Now go back to the entrance and look to the left. There is a crank, which can only be activated with the magnetic module. Turn clockwise and then press the terminal to the left. - Turn around 180 degrees, run backwards and then right through the gate. Go up the ramp and defeat the guard. - Take a look at the waterwheel and stop it with an ice block as soon as you can see the terminal. The ice block belongs to the square tube on the left. - Now leave the room and turn right. Shoot the eye and continue. When the second waterwheel arrived, you have to command the trunk of Ruta to the left. This is how the wheel moves. - Now change the position of the key two to the left. The big water wheel will now turn differently. Use again your Stasis module and stop the large ball, so that it cannot reach the outer ring. - Then you can see the next terminal, which you can now use. Turn around and walk back a bit. Turn left to the small water wheel and jump down. (4-Treasure Chest: Stand between the two wheels and look at the bigger one. Here, you have to destroy the eye and grab the crate). - Drive all the way up to jump down on the other side. - As you move up, you can drop the trunk all the way down. Then jump down to tackle the guard. - Look for an orange glowing floor plate on the floor. Activate them. - Now place the trunk on the 5th droplet from below. Turn around and fly to the elephant's head. Around the waterfall. Now put the trunk down again and fly back. - You must land exactly on the front of the trunk. Go ahead and see the terminal. Jump and put the trunk on the 5th from above. - Turn around and look down. At the waterfall you will find an opening. Glide in here. - First, clear the eye on the ceiling and turn clockwise on the crank with the magnetic module. - Open the Titan control and set the trunk down two droplets. Now jump down to the last terminal. Return to the entrance of the dungeon. Now follow the battle against Ganon's water curse. More dungeons will follow as soon as we have explored them. If you already have tips and treasure chest locations in the remaining three caves, please write us a comment.